Featured amenities include a computer station, complimentary newspapers in the lobby, and dry cleaning/laundry services. Planning an event in Caceres? This hotel has facilities measuring 54 square feet (0 square meters), including conference space. Self parking (subject to charges) is available onsite. Make yourself at home in one of the 86 air-conditioned rooms featuring minibars and flat-screen televisions. Complimentary wired and wireless Internet access keeps you connected, and satellite programming provides entertainment. Private bathrooms with bathtubs or showers feature complimentary toiletries and hair dryers. Conveniences include phones, as well as safes and desks. With a stay at Exe Agora Caceres in Caceres (Caceres Old Town), you'll be steps from Gran Teatro de Cáceres and San Juan Church. This 4-star hotel is 0.5 mi (0.8 km) from Plaza de Toros and 1.1 mi (1.8 km) from Casa Pedrilla History and Culture Museum. For lunch or dinner, stop by Orellana Restaurante, a restaurant that specializes in regional cuisine. Dining is also available at the coffee shop/café, and room service (during limited hours) is provided. Wrap up your day with a drink at the bar/lounge. Buffet breakfasts are served on weekdays from 7:30 AM to 10:30 AM and on weekends from 7:30 AM to 11 AM for a fee. 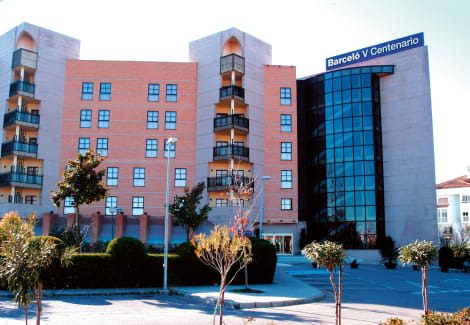 The Barcelo V Centenario is a modern and comfortable hotel strategically located in the most beautiful residential area of Caceres, just 2km from the city centre. The city has been designated by UNESCO World Cultural Heritage. Besides being ideal for meetings and events, this is a wonderful choice for the leisure traveller as good leisure facilities complete this unique hotel offering.